Button mushroom (Agaricus bisporus) slices were dehydrated using ultrasound-assisted osmotic dehydration (UOD), and three osmotic agents including sucrose, glucose and sodium chloride were investigated for their effects on the mass transfer characteristics, average density and microstructure. Different mathematical models were selected to describe the osmotic behaviours, and the effective moisture (Dm) as well as solid diffusivities (Ds) during UOD were also calculated. The results showed that, during UOD, button mushrooms had the highest Dm values in the sodium chloride solutions, and they had the highest Ds values in the glucose solutions, which indicated that faster moisture and solid transfers could occur in these two osmotic solutions, respectively. Moreover, the Weibull model provided the best fit for the UOD curves of button mushrooms under the study’s operating conditions, which showed good predictability for the moisture and solid contents of the button mushrooms during UOD. In addition, sucrose agents were suggested for use in the UOD of button mushrooms due to the better microstructure of the products as well as the appropriate rates of effective moisture and solid diffusivities during UOD. 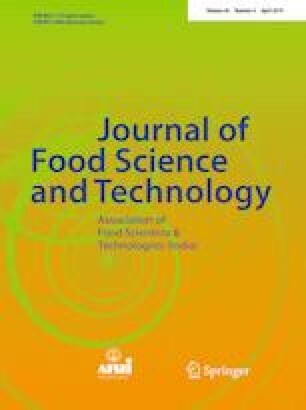 This study provides a theoretical basis for the deep processing of mushrooms and other food products. The authors acknowledge financial support from the National Natural Science Foundation of China (Grant No. 31601482), the Natural Science Foundation of Jiangsu Province (Grant No. BK20159086), the Qing Lan project of Jiangsu province and the Priority Academic Program Development of Jiangsu Higher Education Institutions (PAPD).